If you’re looking for something more sentimental—perhaps if you are mourning your team’s loss (looking at you English fans, in particular my mate Julian)—you may prefer this touching song that includes the lyrics “You are so beautiful to see” and “ What a happy way to live.” Aw, Wayne Rooney could use a bit of loving at the moment. Now that I’ve impressed you with my uncanny hipster knowledge of Brazilian music (aka everything I know about it), it’s time talk about what matters: U.S. soccer. Oh, wait, there were matches today? Right, well, it appears that Ecuador unfortunately fell asleep in the final seconds of an evenly fought battle with Switzerland, and the usually passive, “neutral” Swiss uncharacteristically seized the win. The end of that match is well worth the watch if you haven’t seen it yet. It’s always great when a sport’s quirky rules play out to their logical extremes and a team is able to take advantage. Like the bizarre chess move when a player can switch his King with his Rook on the back line, a player who is fouled in soccer has the ability to play on, and the ref should let him forge ahead if he has the advantage in moment following the foul. That is exactly what happened for the Swiss today, as their goal was scored after a rough foul by an Ecuadorian midfielder, causing the whole Ecuadorian team to stop playing and giving the Swiss a breakaway that was finished off expertly by the opportunistic forward and substitute Haris Seferovic. 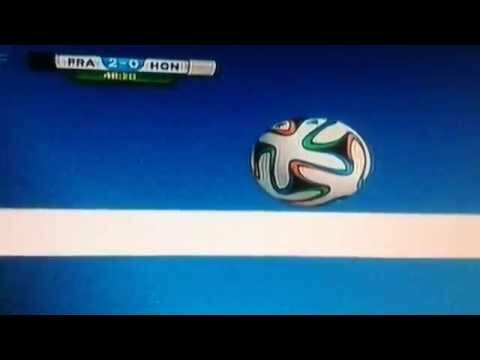 In the second game of the day, France gave us the first opportunity to use goal line technology when it mattered. Before that, ESPN had to revert to using the technology on goals that were clearly…well…goals to anyone who wasn’t completely blind. It was cute and all, but they must have been absolutely thrilled when French forward Karim Benzema’s 48th minute strike was almost saved on the line by Honduran keeper Noel Valladares. The technology showed that the ball had clearly crossed the line, and after further reviewing the play, officials decided to take the goal away from Benezema and score it as an own-goal. We thus have four players so far in the first round tied at two goals: France’s Benzema, Holland’s Robben and Van Persie, and Brazil’s Neymar. In the final match of the day, a tough-fought match between Argentina and Bosnia, the Blue and White’s midfielder Lionel Messi dazzled the ball around a host of defenders to get on the scorer’s sheet, the latest indication that the stars are showing up for this tournament. So, you expert readers, you, who will win the golden boot? Enlighten us!